Children start to have their first tooth at the age of six months. It is this crucial period that parents or guardians need to watch out a few matters pertaining to children’s dental health. 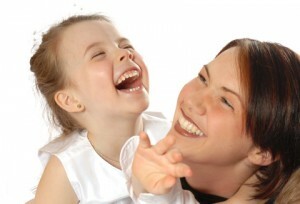 Pediatric dentistry refers to dental matters on children. The most common problem in pediatric dentistry is dental caries or tooth decay. Baby bottle caries is also known as early childhood caries or ramphant caries. 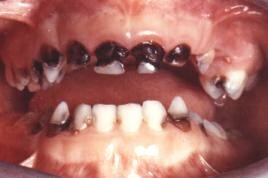 It is characterized by severe decay covering all or most of children’s teeth. It is a result of poor cleaning or brushing and bottle feeding of sweetened liquid (milk or juices) while children go to sleep. After feeding, sweetened liquid traps underneath the upper lip. As the children only brush when they wake up in the morning, prolonged contact of sweetened liquid on the anterior surfaces of upper teeth gains time for bacterial metabolism and secretion of acid causing tooth decay. 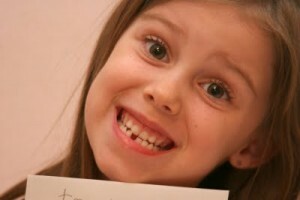 This is characterized by chocolaty looking front teeth which is common among children when they smile. Seek help through a dentist. The teeth would be filled if it is restorable. For cases with only roots retained will be placed as space maintainers for the permanent teeth. They shall be extracted once signs and symptoms set in. Early extraction of teeth may cause unwanted shifting of other teeth present in the mouth. This reduces space for the succeeding permanent teeth causing crooked teeth in future. Severely infected baby tooth with pus would cause unwanted changes of surfaces of permanent teeth. They would show certain discoloration or impaired calcification of enamel making them more susceptible to tooth decay later on. It is also known as enamel hypoplasia. Do not bottle feed your child to sleep. Practice good oral hygiene habits. Start correct brushing technique while they are young. Make it a routine to brush twice a day. Have a routine dental check up with at least 6 months interval. When children suffer accidental falls that landed on their faces, there would be trauma to their upper front teeth occasionally. This trauma would disrupt the normal growth and development of the succeeding permanent teeth. Usually, the upper front teeth roots would curve abnormally causing them to erupt abnormally or do not erupt at all. Extraction of abnormal tooth and restore later with denture, dental bridge or dental implant. Dental bridge or implant is advisable only when the child is 18 years of age. Early extraction is sometimes advisable because it may disrupt other permanent teeth’s growth and development. Try to avoid unwanted falls or accidents when the child is growing. Children may lose their teeth to trauma or tooth decay. A child should have 20 teeth by the age of 3. Try not to extract baby teeth if possible. Always try to restore it as it serves as space maintainer for permanent teeth to erupt. Do not extract baby teeth to allow permanent teeth to erupt into a seemingly better position as it would cause further teeth mal-alignment. How do baby’s teeth grow? This entry was posted in Oral Care and tagged baby bottle tooth decay, crooked teeth, Dental caries, dilacerated tooth, early childhood caries, enamel hypoplasia, pediatric dentistry, tooth loss on November 19, 2009 by Dr Erica Tan.